"Okay class, today we're going to read through the dictionary again, just like we do every day!" "Wooohooo! Yippee! Thanks, Teacher! We love you!" We often compare the process of learning aikido to that of learning to write. We start by learning to make various brush-strokes - diagonals and loops and that sort of thing (tegatana dosa), then we learn the shapes of capital and lower-case letters (releases), then we learn to spell simple words (junana) and harder words (owaza), and along the way we learn some rules about the structure of sentences (the riai within junana), and eventually we get to the point we can write essays and love letters and poems and stories (randori, embu). But who here has ever learned to write love letters by reading through the dictionary from start to finish over and over again? Sure, dictionaries and encyclopedias and the thesaurus are useful tools in writing - but they are certainly not primary teaching/learning tools. Junana hon kata is largely organized like an (albeit short) encyclopedia of things that you can do in aikido - five common ways to hit uke, five things you can do with his elbow, four things you can do with his wrist, and three things you can do when uke is coming down from a peak in his walking cycle. Sure, within each set there is a little bit of implied teaching on strategy - sort of "if this doesn't work, you can do this other thing." but this kata largely reads like an encyclopedia - lots of "whats" and "hows" and not many "whys" or "whens." And this thing is our primary teaching tool up to about shodan! We are learning composition (randori) by repeatedly reading through the encyclopedia (Junana hon kata) over and over again. I don't think this would be so bad if we used Junana like it seems Tomiki might have intended it - as an aikido primer that we spin through a few times right at the beginning of our aikido careers to prepare us to jump into randori and Koryu kata. But what makes it worse is we actually stretch Junana out over the course of 2-3 years as a ranking thing. That would be like saying that 1st graders have to read through the As and Bs of the dictionary for a year before they can become 2nd graders and get to read through the Cs and Ds. - it's not till 12th grade that we have all the tools we need (like Xylophone and Youth and Zither) that we need to actually write something cool. Hell, we wouldn't even be able to write "See Spot Run" until 9th or 10th grade, when we get to the Rs and Ss! What do we need to begin doing composition (randori) early and to get there in an orderly, structured, pedagogical manner? and maybe a tutor would help - an uke that already knows what's going on in randori. 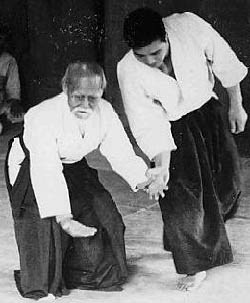 The urawaza was an early attempt at providing a step between Tomiki's primer (junana) and full-fledged randori, but they can tend to teach players to do half-hearted techniques so that they can be properly countered. Sometimes we still like to play with urawaza and here is how we solve the half-assed problem. JW Bode's practice of practicing each junana technique from each release is brilliant, but one potential problem is you multiply Tomiki's minimalistic aikido primer (15-25 techniques) into a practice set of 8 releases times 17 junanas plus some owazas = around 200 things to practice. Something that I've been working on lately is creating a whole new primer - shorter and faster-to-learn than the Junana, containing a few techniques from each set in Junana, with each technique glued to a release or other common attack (as per JW above). I think the new primer would have about a dozen techniques and I think this primer would be thoroughly teachable by about green belt (40-60 mat hours).